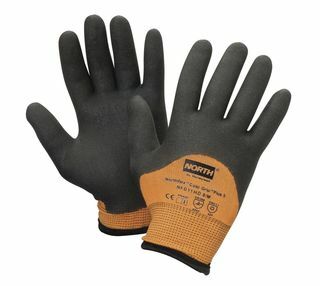 Honeywell Safety NFD11HD/10XL NorthFlex™ Cold Grip™Plus 5™ Cut Resistant Gloves, foam PVC 3/4 coating, Black/Hi-Viz Orange, XL | Products | Personal Protective Equipment | Hand & Arm Protection | Cut Resistant Gloves | Light Duty Cut Gloves | Scientific Sales, Inc. Cold Weather Performance with double the protection! Cold Grip Plus 5 provides a high-level of cut, slash as well as cold weather protection. This flexible, dipped glove is constructed of a highly cut-resistant fiber blend outer shell and brushed acrylic thermal inner. Foam PVC coating is 3/4 dipped to cover more surface area to help inhibit liquid penetration.